For those of you new to the Titan girls basketball program, this past weekend was a monumental step in the right direction as they opened the season winning two of three games at a tournament in South Park. The Titan girls have won just one game in the past two seasons. But coach Mike Moran continues to work with them and the girls continue to work for him, and they finally saw the fruits of their labor opening the 2016-2017 season. 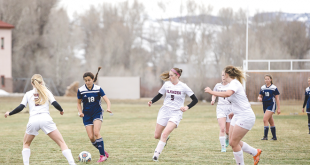 While Moran admits the competition wasn’t quite near the level of programs they will see in league play, they did take down two opponents in South Park and Cripple Creek that they’ve lost to the past two seasons. In addition, Moran saw a side of his team that he hadn’t seen in his first three years at the helm. The Titans opened the tournament against Skyview Academy and it looked like Moran and the squad were back to their old habits. The Titans fell behind early and couldn’t climb back into the game, eventually falling 38-20. Sophomore Siena Truex led the team with 10 points, followed by junior Sydney Petersen with six. Worried that his team would simply implode from the disappointing loss, Moran shared his disappointment with his squad and looked for them to turn it around as they took the floor against the South Park Burros. The team heeded his words and battled through all four quarters with the host team. The Titans were down 20-19 late in the fourth quarter and rose to the challenge, scoring the final four points of the game, including hitting a couple of clutch free throws for the 23-20 win. Petersen led the team in scoring against South Park. Moran touts the effort of Truex and Tess Fenerty on defense and the work of Katherine Washburn inside as keys to the win. The Titans closed out the weekend with a thumping 33-15 win over Cripple Creek. The Titans lost twice to Cripple Creek by one point the past two years but tough defense and execution of offense paved the way for the resounding win. After going up 5-2 in the first quarter, Petersen caught fire to score 10 points in the second quarter and the Titans defense clamped down to take a 17-4 lead into halftime. The Titans continued to dominate in the second half and Moran closed the game by getting everyone onto the floor in the fourth quarter as Crested Butte cruised to the win. The Titans will now face the gauntlet as they head to Antonito on Saturday, December 10. 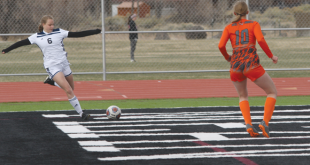 Antonito is the pre-season favorite to win the 1A state title and Moran looks forward to the game as a challenge for his girls to see how well they’re really playing.